I have finally finished painting the bathroom cabinets and am excited to show them to you! 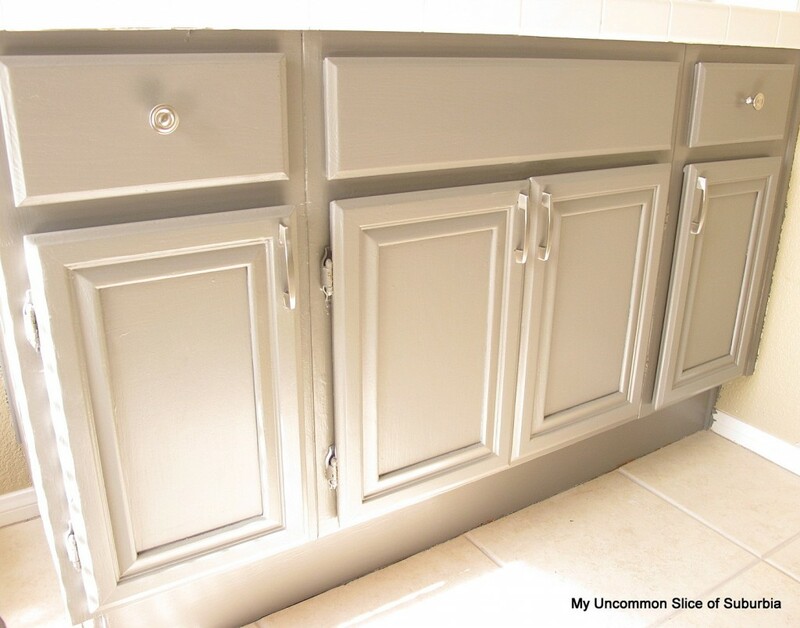 Our home is a 90’s builder grade so anytime I can get my hands on oak cabinets and give them an inexpensive update using paint, I can’t wait to show you how! Had I not decided to put hardware on, they would have been complete awhile ago but we all know how that went. 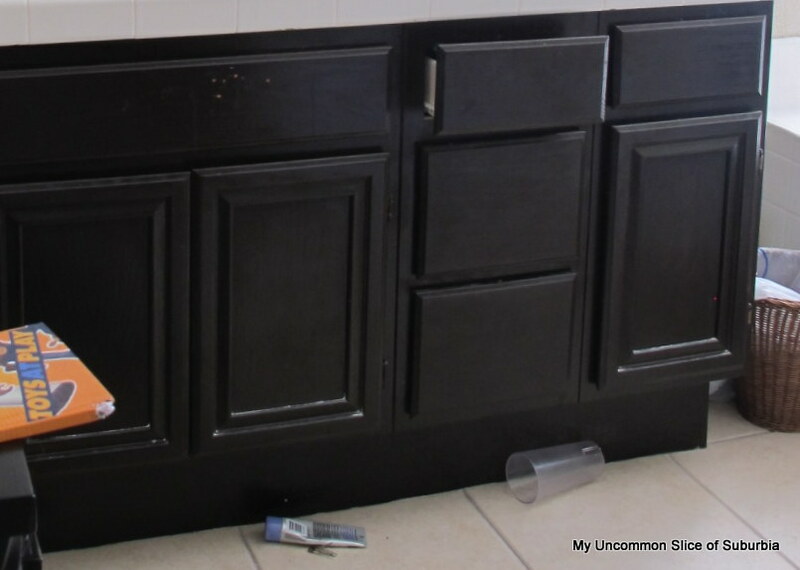 About 5 years ago I had gel stained the oak cabinets, I loved it but the stain was beginning to peel in highly used areas which is normal. 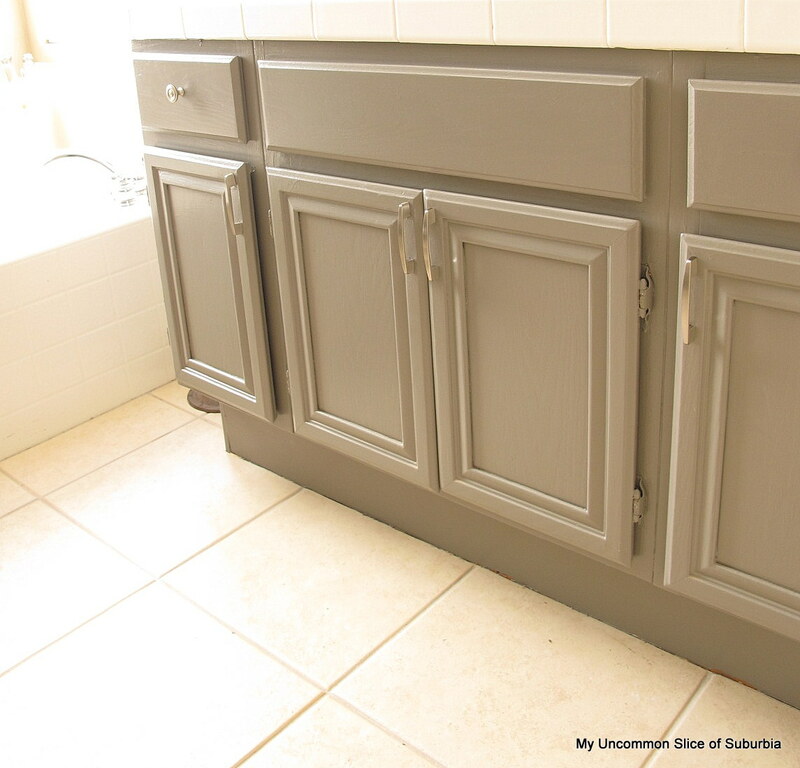 Instead of re-staining I decided to brighten the cabinets up using Chelsea Grey by Benjamin Moore, I had it color matched by Behr. Here are the steps, same as the kitchen and loft. 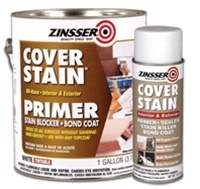 Prime, I have had wonderful luck with Zinsser. You don’t have to sand with this product but I still give it a light buffing. Foam rollers will give you the look as though your cabinets have been sprayed. 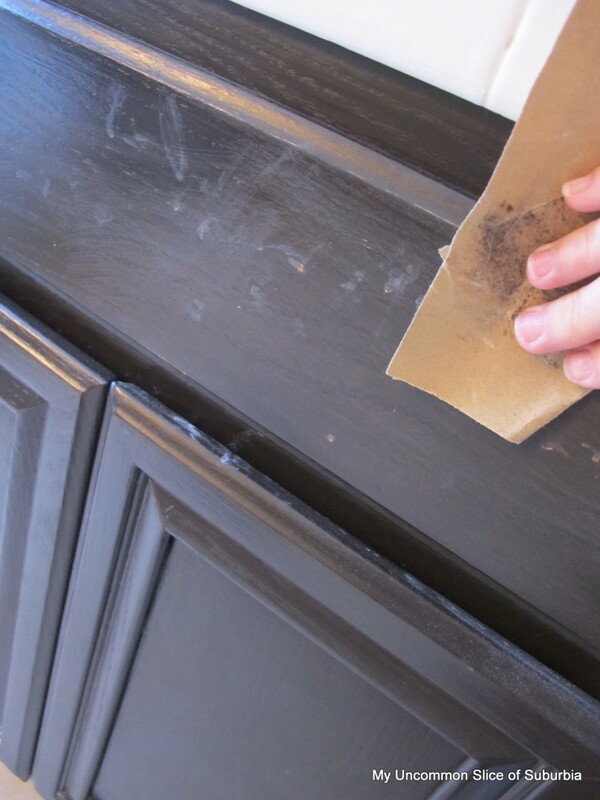 Use a sanding sponge to buff out any drips after it has dried. NOTE: Latex paint will adhere perfectly to oil based primer. Latex primer over oil paint will not work at all. Let it dry, buff out any drips and give it another coat. Have your hubby add the hardware, obviously there are some things I just am no good at. Still have touch ups on the wall and floor, I am not the neatest painter. Even though this is not my bathroom cabinets this is the type of oak that is under all these layers of paint and stain, yuck. Cost for the paint was $30 and I have at least 3/4 of a gallon left and $30 for the hardware so $40 for brand new cabinets! YAY! For more information on updating your back-splash click here. How we framed our mirror click here. Love them! perfect color of gray. My cabinets have had the same evolution. ugly oak, to black to gray…and I am so pleased! Can’t wait to party with you next week at the Ready 4 Summer Party! Thanks. We are doing ours next week. I think we can do this. They look great and I love the color. I was going to ask you how you went about doing yours just around the time you had your mishap with the hardware. 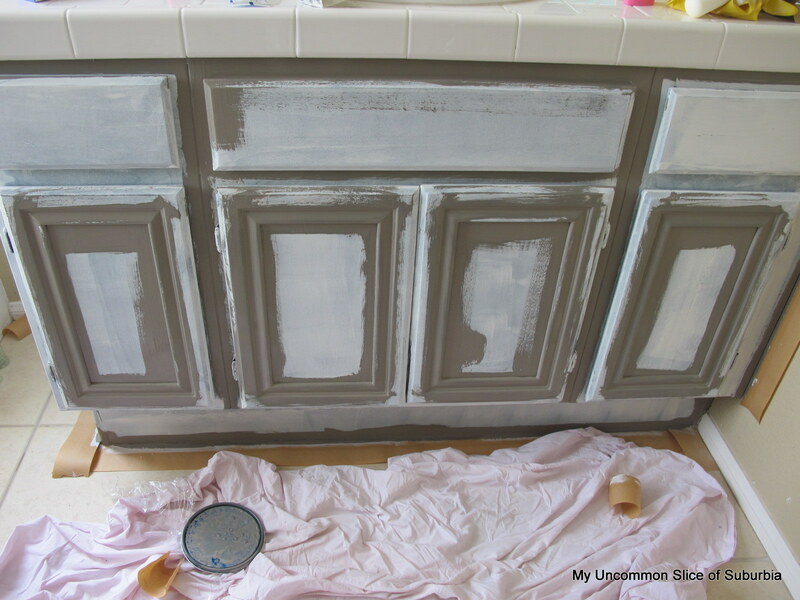 I decided to wait since I figured if you are anything like me the last thing you would want to do is give a tutorial on painting bathroom cabinets. lol. I hope ours come out as nice as yours. I love how they look! The color and the hardware make them look like a piece of furniture! Great job!!! 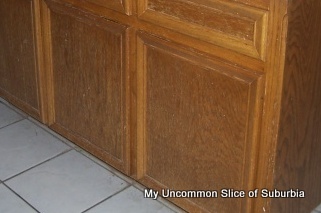 I have those yucky cabinets that you have in the “before” pic…bleh! I love the grey. You mentioned that you had peeling from the gel stain. Did you top it with poly? I was thinking of using gel stain on my stair railing. Do you suggest I go with traditional stain as opposed to gel since it’s high traffic? This is great – thanks for the post! I’ve been dying to paint my bathroom cabinets, too, but have been advised against it several times by the folks at the paint store because they say it wouldn’t work with the humidity in the bathroom during hot showers. Have you heard this or had experience? Perhaps I was given bad info, but I’m curious of your thoughts? Thanks again for a great post, they look amazing! they look gorgeous! i love that shade of gray! They turned out beautiful Krisitin! That is a lovely gray…very striking! You did a fantastic job. Happy weekend to you. That was worth a little delay! 🙂 They’re so fresh and stylish, I can’t wait to see your fabric choices to coordinate with that beautiful gray! 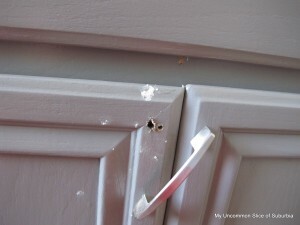 Looks great, did you paint the hinges?? I removed mine when I did my bathroom and laundry room cabinets but I’m getting ready to do the kitchen and would like your input on the hinges. 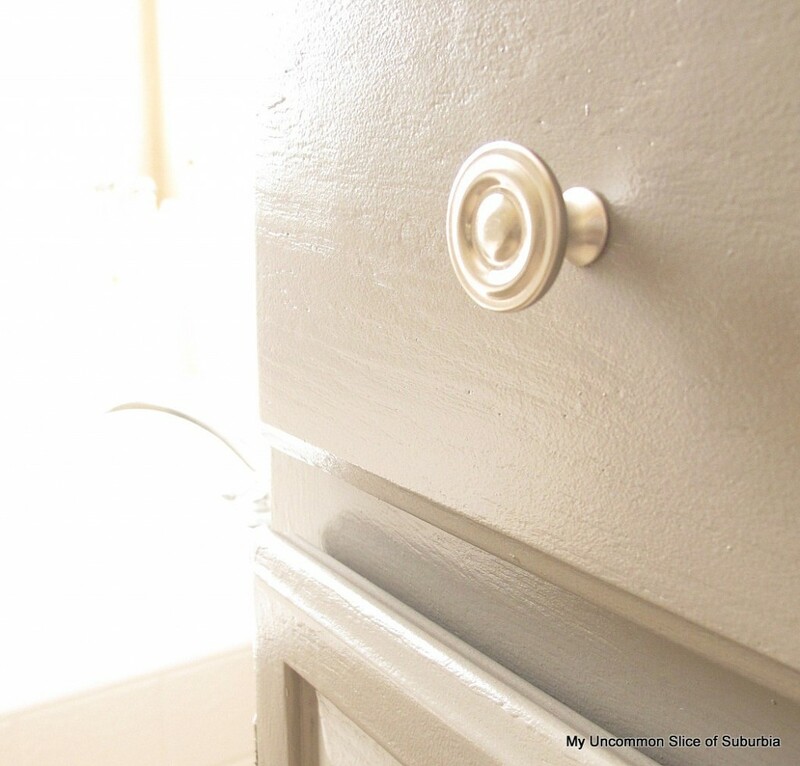 Kristin, the new color is SO pretty, I love it with the silver nickel hardware!!! Gorgeous. Can’t wait to see the rest of the projects unfold in this space! Heather, they are lovely! You have inspired me so much. I tackled my boys bathroom this past week and so far, the cabinets are turning out just great! I thank you for all your tips. Can’t wait to see your finished project, I know it will be incredible! Smart lady to use elbow grease to transform them. If you bought new I don’t think they could look any better and your wallet would be less full. They turned out great, Kristin!! 🙂 You had mentioned wall touch ups and not being the neatest painter. I’m not either, had the same problem in my bathroom. If you’ve never tried Frog Tape, you have to! It’s more expensive than other painters tape but it’s worth every penny! I used it to make my chevron tray last month and each stripe turned out perfectly. It was my test project for the Frog tape and now I won’t use anything else! Such a fresh and pretty update! Good job! I always say what a difference a gallon of paint makes. It is no fun painting cabinets but after it is all done it is so worth it. Wish I could have you come over and do mine. STILL have to do our kitchen but I think I am going to do some kind of refurbished just because ours are SO bad. Love the new color, Kristin! The hardware suits it beautifully! I love the color Kristin. What a wonderful, fresh update! Have a super week ahead!! I absolutely LOVE the color! Soft but makes a huge impact! These turned out great! I have been keeping up on your bathroom progress! It is coming along nicely! Lovin’ it! 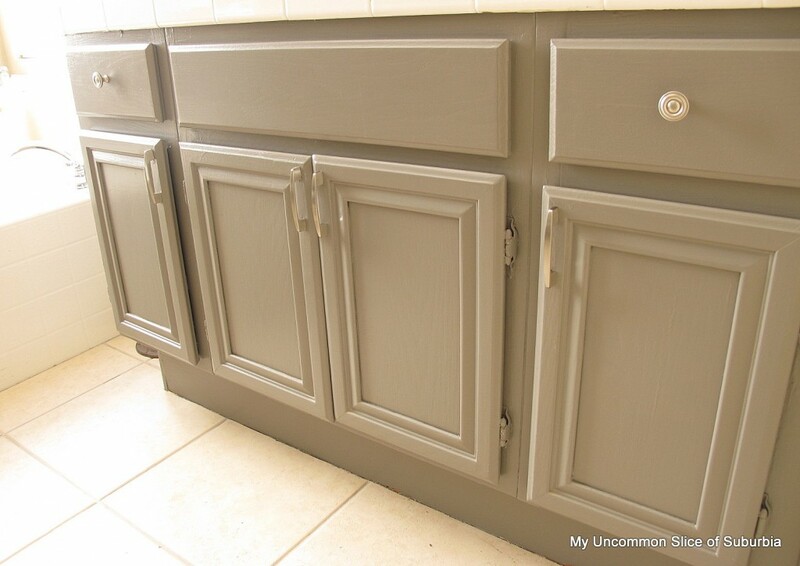 I just painted my cabinets a similar color. Looks fabulous! I love Chelsea Gray!!! Can’t wait to see the rest of the bathroom when you are finished! Great tip with the Zinsser. I cant stand sanding when I want to get straight down to painting, so I’ll definitely have to get down to Home Depot and get me a few gallons of that! I’m telling you, that Chelsea Gray is my new favorite color, but isn’t it a trip how much its tones change depending on the light? It has my head spinning. Beautiful cabinets-nice work! I really love the finished look ~ the color is perfect and your tips…well, I need ALL the tips I can get. I’m hoping to do a lot of painting/updoing/redoing this summer. I love the look of your cabinets and hope to paint my own oak bathroom cabinets soon, too! 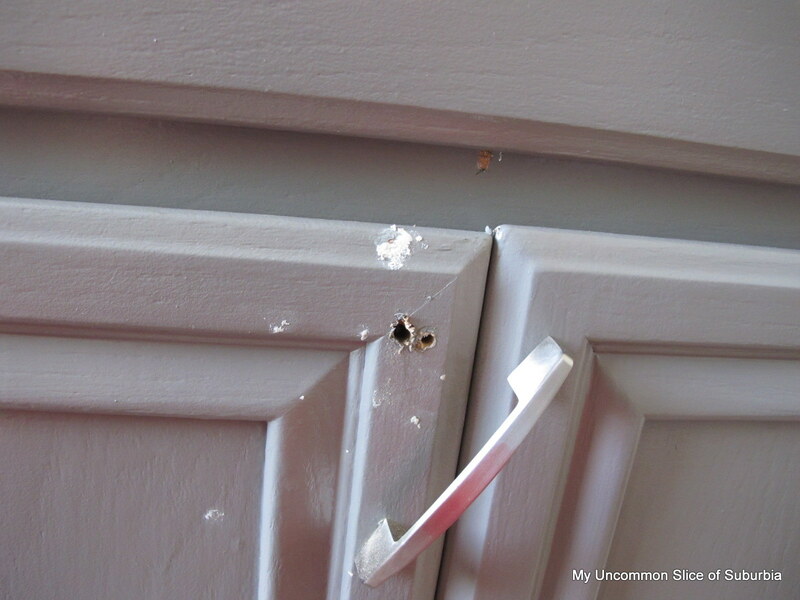 I have a couple of questions, did you take the hinges or doors off the cabinet or paint with both attached, do you have any issues with it sticking if you left them on, and did you paint the back of the doors or leave them oak? This turned out beautifully! I love the way it looks with the backsplash! 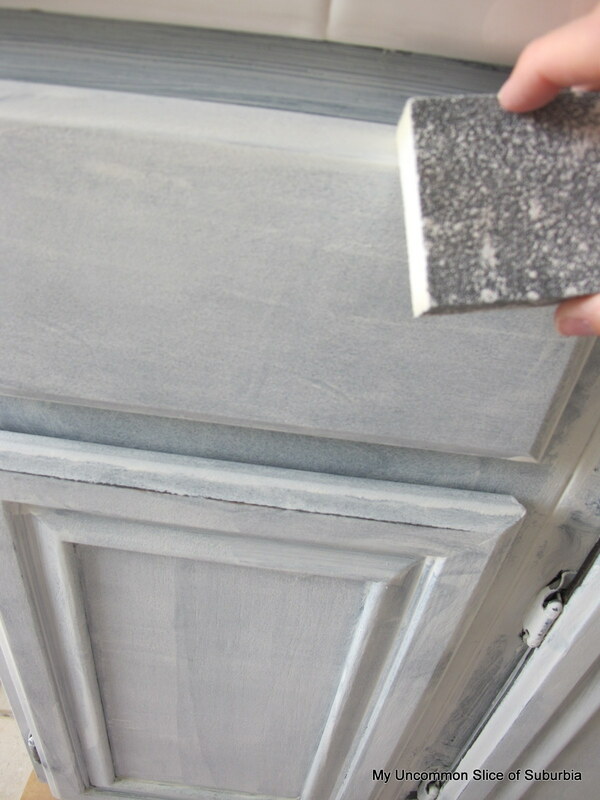 We just painted our kitchen cabinets and we loved the Zinnser primer as well. 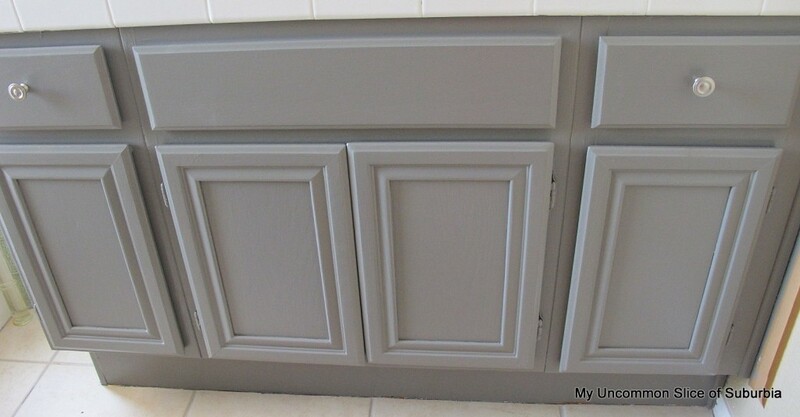 I’ve been dying to paint my bathroom cabinets, too, but have been advised against it several times by the folks at the paint store because they say it wouldn’t work with the humidity in the bathroom during hot showers. I love the colors! 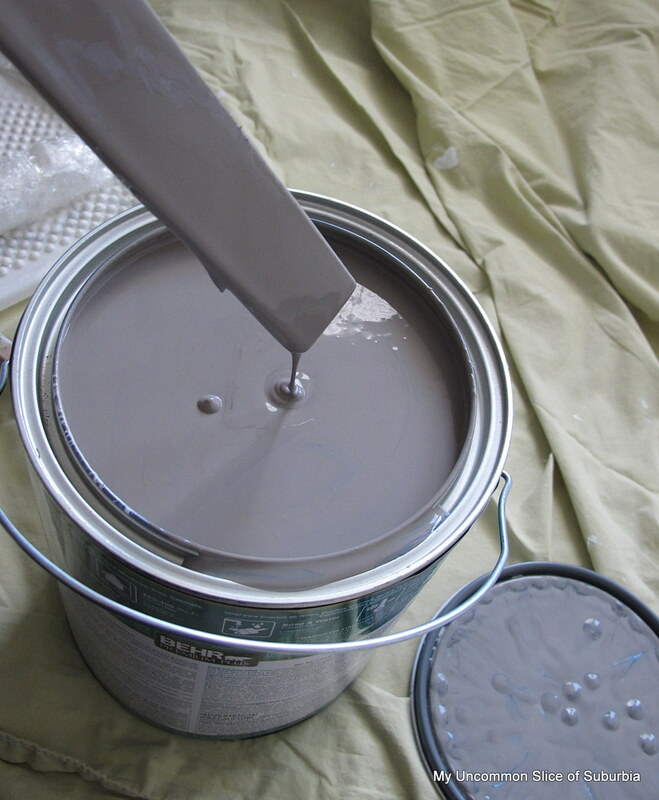 What color did you use on your walls? Love the look! What finish paint did you use, satin, semi-gloss…..? What a gorgeous job you did. You have inspired me to paint my oak China cabinet instead of selling it. Thank you for sharing! Thank you so much Paddy, good luck with the cabinet! Hi i justed wanted to know if yu had to use a sealer after?? Hi Shante, no I did not use sealer and they have held up great. 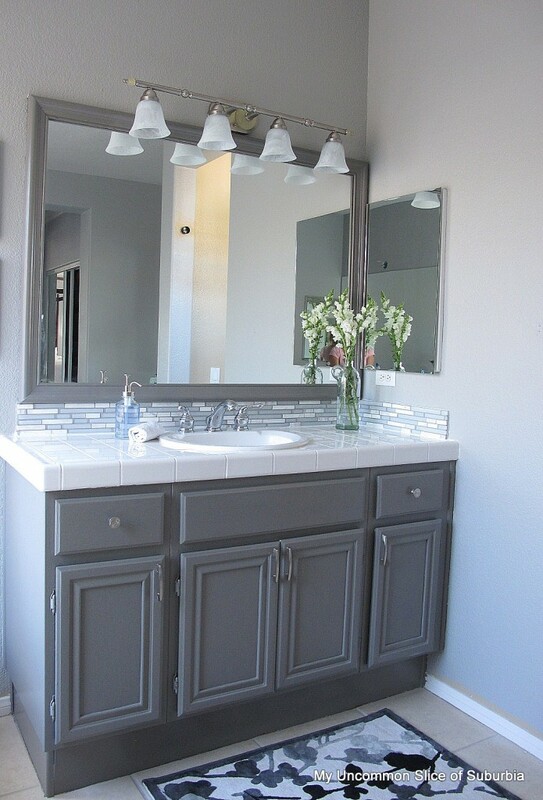 I see you used Chelsea gray in bathroom – it seems a coupk of th pics are a beige looking color , is it just the lighting or are those a different project and color ? It looks awesome ! Hi Michelle, we used dutch boy Route 66 on the bathroom walls, here is a better shot with how the paint looks like during the day. http://myuncommonsliceofsuburbia.com/diy-luxury-bathroom-makeover/ The Chelsea grey was used on the cabinets which is a little darker. Let me know if you have any other questions, happy to help. Love this! I wanted to ask — how well is the paint wearing? I’ve read others who suggest using an enamel paint or putting poly on top. 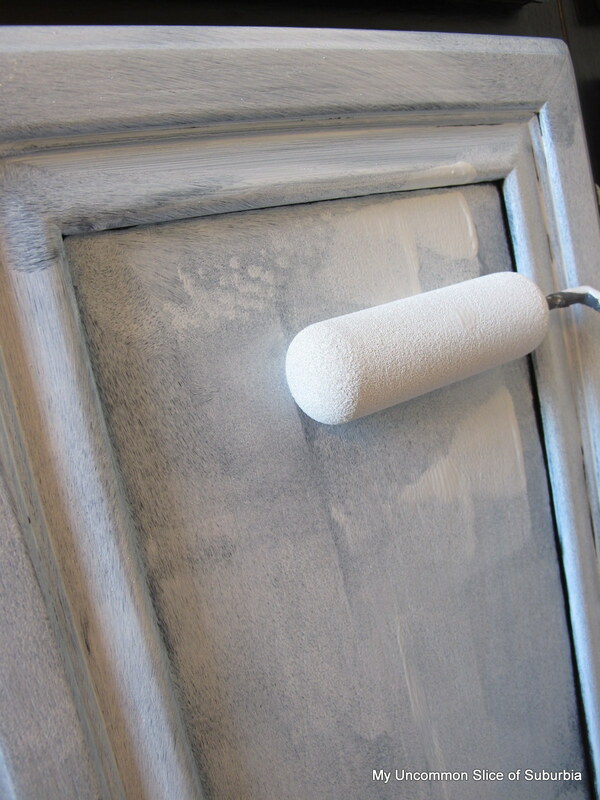 I am about to paint my oak bathroom cabinets gray, so am reading up on tips! 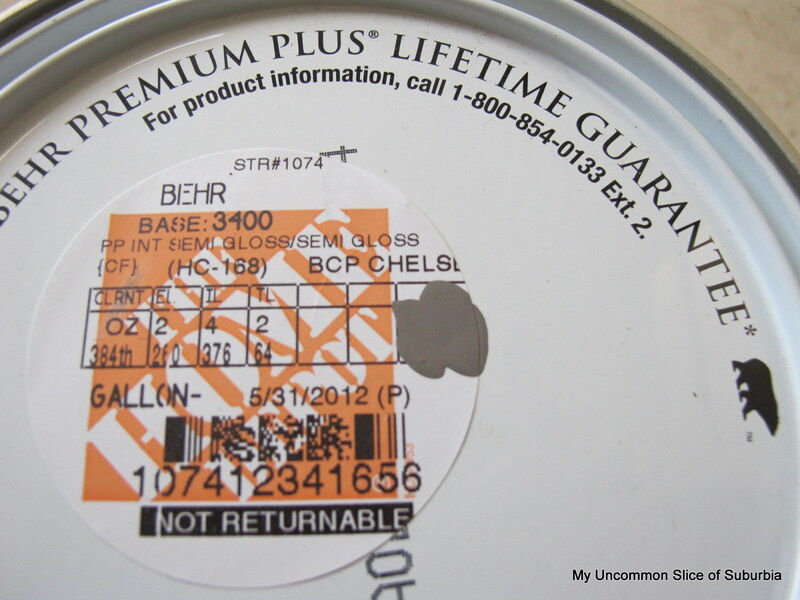 Also — how did you color match the Behr paint to the paint you used? Do you just bring in the card with the color? Thanks! !